Although I realize some parts of scripture are written poetically (such as Psalms and Song of Solomon) or tell metaphoric stories (such as parables) or foretell prophetic visions (such as Isaiah and Revelation), I recognize the Bible as actual literal history. In other words, the events the Bible describe actually happened. That is what I mean by describing myself as a literalist. That doesn’t mean I need to literally pluck my eye out if it causes me to sin because I realize that is a metaphoric picture of the eternal ramifications of sin, but when it describes marching around Jericho or the Exodus from Egypt (or any other occurrence) – that is an actual historic event. The problem many Christians and churches have with taking the Bible as literal history is normally with events such as a 6-day creation, the worldwide flood, and unbelievable accounts like Jonah in the fish for three days. Normally these objections are followed up with claims that science has proven these events impossible, therefore they MUST be metaphor for something else. To me, these scientific objections seem like a strange reason to deny Biblical authority. For one, science only studies the natural world. It ignores any supernatural influence. Therefore science can NEVER rule out supernatural influence. Secondly, the same Christians who deny these things “based on science” have no problem with the miraculous accounts of Jesus’s virgin birth, walking on water, and rising from the dead, although science has also proven these impossible. So, why is this the case? Well perhaps the accounts of Jesus are possible because he is God. I agree. But that is EXACTLY why all the other accounts are possible as well! To me it makes no sense to classify one supernatural event as impossible, and accept another one. The atheists already know this! 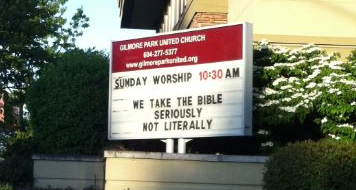 They know that if you do not accept the Bible as literal history, your faith in Jesus fails. I think those who operate this way have built their faith on the sand where it is easily washed away. The only reason we know Jesus lived, died, and rose again is because we trust the eye-witness accounts who wrote it down for us to know. We trust the Holy Spirit to have guided the writing and translation process. And whenever any disputes come up we can always compare our modern versions to the thousands of ancient copies in the original language. If the Bible is not a trustworthy document, then we have no reason to believe in Jesus. This is what has driven many people to atheism. For me, I want to be a logical and consistent Christian who is able to defend his faith. To me, believing in the Bible as accurate history is the only way to do this. So does this mean blindly accepting accounts such as a 6-day creation and worldwide flood blindly and ignoring all evidence to the contrary? Not at all. I heard it put this way recently: the Bible is not a science textbook, but if it is the true history of the world and the word of God, then when it does touch on scientific issues – it is the authority. For example, the Bible doesn’t talk specifically about natural selection, but it does give us a general overview of how animal species got here and how they were commanded to reproduce (after their own kind). When we accept that as truth, then we see natural selection for what it really is – completely Biblical. Natural selection happens, we observe it daily. Small changes within a species. Evolutionists take those small observed changes and hypothesize that the small changes have added up into big ones (unobserved) and can be credited with all the variation of life on the planet coming from one another. This is a concept that can never be verified since we cannot go back and observe, test, and repeat this idea. Observing, testing, and repeating something is what makes it scientific. Therefore hypotheses about the past that cannot be observed, tested, or repeated will forever remain hypothetical. Since observed natural selection (dogs reproducing into dogs, cats to cats) even with variation is 100% Biblical, and the idea of all life coming to fruition through this process is unverifiable/unobserved, I then have no logical reason to dismiss the unseen Biblical account of creation to bow to a different unseen explanation. Others will say there couldn’t have been a worldwide flood, where’s all the evidence. And I would say the evidence is everywhere – billions of dead things buried in rock layers laid down by water all over the earth! There is basically two theories to all of geology – a little bit of water over a long period of time or a lot of water over a short period of time. The second theory lines up perfectly with a worldwide flood. But how could Noah fit ALL the different animal species. See the part about natural selection above. Perhaps Noah wouldn’t have needed every single species of dogs or cats, just a couple representatives that later would diversify into all the variation we see today, cutting the total number of animals down considerably. The worldwide flood is completely consistent with modern science. That is just a couple examples. I believe when we use the general scientific information in the Bible and use that as our guidelines when we do science, all the scientific evidence only confirms what the Bible tells us. Atheists will claim “confirmation bias”, but little do they realize they do the same thing! They start with an assumption that no supernatural forces exist or interfere with the world, and that everything works today the same as it did in the past – two very unverifiable assumptions. Therefore we both have unverifiable assumptions when we come to the evidence. These assumptions are what we use to interpret the evidence. You see, evidence doesn’t speak for itself. A dinosaur bone does not come out of the ground with a nifty nametag on it saying “65 million years”. We decide that based on interpreting it, and we will always interpret it based on our starting assumptions. No way around it. There is no unbiased science. I believe God did come to our planet as a man, die, and was raised from the dead because archeological evidence confirms the places/people, personal experience confirms it, and a trustworthy historical document which passes all criteria for judging a historical document’s accuracy with flying colors recorded it. If I believe this part of the document, I have absolutely NO reason to reject another part of it. For those that do reject parts of it, but accept the accounts of Jesus… why? Can you recall the first recorded words of Jesus? It wasn’t Matthew, wasn’t John… how about “Let there be light”. Are you actually rejecting Jesus by rejecting his works? The Old Testament is still a testament of Jesus Christ. He is all throughout it, and it is defendable… but you are not going to be popular if you do! But is popularity or conforming to the consensus really what being a Christian is all about? For more information on how to defend the faith Biblically and scientifically, please see my Top 20 Q&A section.